A Comparison of Single Incision Laparoscopic Cholecystectomy with the Gold Standard: Is This the Next Procedure of Choice? Introduction: Single Incision Laparoscopic Surgery (SILS) has gained immense popularity for performing cholecystectomy. This virtually scar-less procedure has promising results as far as hospital stay, post-operative pain and return to work are concerned. In fact, SILS is seen by many as a possible replacement for the Standard Four Port Laparoscopic Cholecystectomy (SLC), which has long been established as the “Gold Standard” for gall bladder diseases. As cholecystectomy is one of the most routinely performed surgical procedure, it is but natural that detailed assessments of SILS and SLC would be required before any conclusions can be made. Our study aims to provide a comparison between SILS and SLC and assesses whether SILS has any added benefits. Additionally it is important to determine whether impacts of this new technique compensate for the added cost burden on patients, especially in developing countries such as Pakistan. Material and Method: All patients presenting to our centers, with symptomatic gall bladder disease and undergoing SILS or SLC during the period September 2009 to September 2010 were included in the study. Seventy seven patients underwent SILS while SLC was performed on the other 114 patients by the same surgeon. The data was collected prospectively using a pre-designed questionnaire. Results: In our study both the groups had similar age, BMI and gender distribution. Two cases of SILS required insertion of additional ports while none of the cases in either group were converted to open surgery. The mean operative time for SILS was 50.6 minutes (22-131mins) which was substantially longer than SLC (p < 0.001). There was no significant difference in mean operative blood loss, post operative pain, analgesia requirement and mobilization. Patients who underwent SILS were able to return to normal activity earlier than patients undergoing SLC (p < 0.001). In most of the cases of SILS the scar was barely visible as opposed to the obviously visible scars of SLC. Conclusion: Our experience suggests that SILS can safely be used as an alternative to SLC. Compared to SLC, it has the added benefit of an early return to work along with excellent cosmetic result. Although, the operative time is longer, it improves with experience. 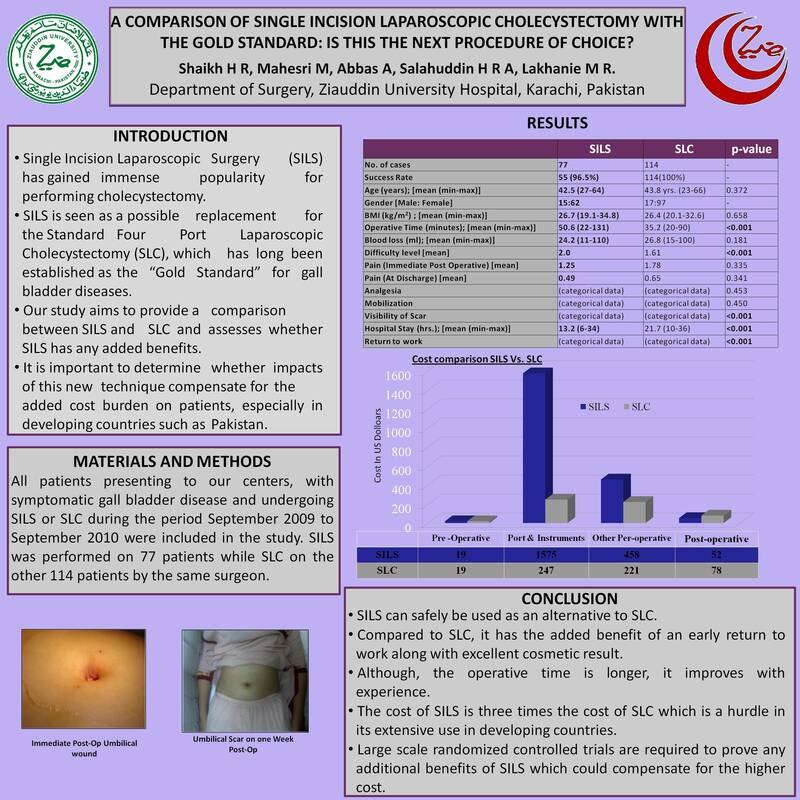 However, the cost of SILS is three times the cost of SLC which is a hurdle in its extensive use in developing countries, where the cost of health is borne by the patients. Therefore, further large scale randomized controlled trials are required to prove any additional benefits of SILS which could compensate for the higher cost.